Bringing November to a close on the blog is our latest artwork reveal. Marvel at some of the incredible pieces of artwork from our February books, and do let us know your favourite! This first plate from Kulikovo 1380 depicts the crucial moment in the battle, when the Ambush Regiment charges from the trees and into the flank of the Golden Horde forces that were moving to encircle the embattled Russian army. A Mongol infantry captain in lamellar armour tries to issue commands to the horrified Armenian archers beside him, but there is simply no time. Prince Vladimir Andreyevich of Serpukhov, in the fore, wears heavy armour, including the distinctive Russian rimmed helmet, while his bannerman is in opulent but more dated armour with decorations reminiscent of Scythian motifs, and bears the heart-shaped shield occasionally used by Russian noble cavalry. 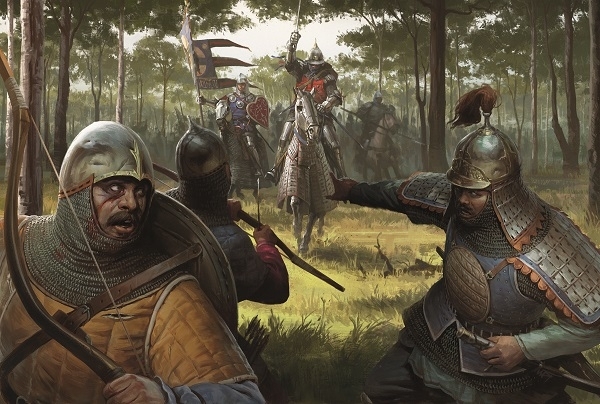 This second piece of artwork from Armies of the Medieval Italian Wars 1125–1325 features three figures from the Battle of Campaldino 1289. In the back, on the left, is a slinger from contado of Arezzo.The general appearance of this slinger is typical of the zafones light skirmishers and bubulci pioneers who performed auxiliary duties in most communal armies. In the centre is a Florentine feditore of Cerchi family. The feditori were young would-be knights coming from rich but non-noble urban families. 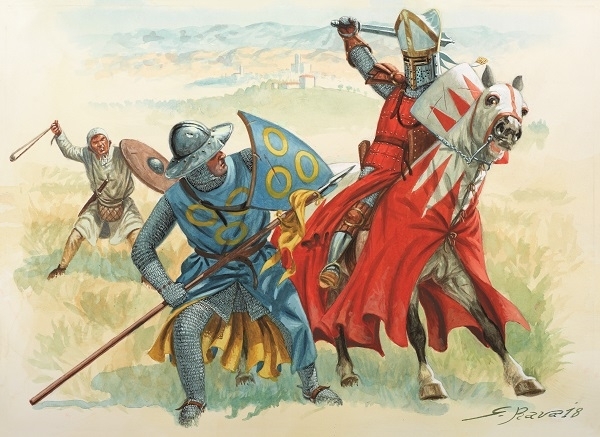 They were equipped as a type of lighter cavalry and had the honour of launching the first charge against the enemy – note the use of a chapel-de-fer rather than a ‘great helm’. The final figure is Guglielmino degli Ubertini, Bishop of Arezzo. Note two features distinctive of ecclesiastical leaders who went to war in person: the crest on his helm fashioned as a bishop’s mitre, and his use of a mace (mazza ferrata) rather than a sword. The latter was a cynical ploy adopted to get around the religious prohibition on churchmen ‘shedding blood’: they could kill enemies, but only ‘sine effusione sanguinis’. The second half of the 13th century saw the development of plate armour elements worn in combination with the mail hauberk. This final plate from Japan 1944–45 depicts a night raid over Akashi shortly after midnight on July 7, 1945. 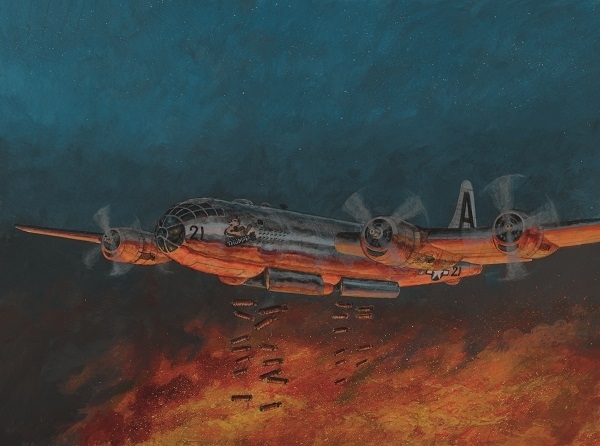 Between 12.15am and 1.27am the raiders dropped 975.9 tons of M-69 incendiaries from altitudes ranging from 6,900 to 8,200ft. The B-29s approached in a bomber stream of individual aircraft, with the pathfinders first. The rest of the aircraft passed over the target city in roughly 30-second intervals, aiming at areas near but outside the fires already burning. The raid devastated Akashi. By sunrise, nearly 60 percent of the city was in ashes. Torn between the two medieval pictures myself. Totally agree with GI GENE, about the calendars. The B-29 one is my favorite. 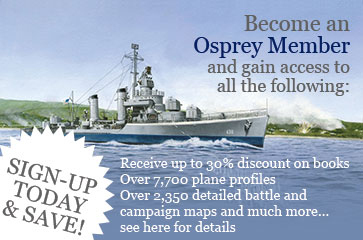 Looking at all these art work sneak peeks makes me miss those Osprey Military History Calendars even more.